Adhesive capsulitis, which is commonly referred to as frozen shoulder, is a condition in which tissues that surround the shoulder become inflamed and stiff. This causes pain and makes it difficult to perform most activities that require the rotation of the shoulder. Frozen shoulder is usually divided into three stages—the painful stage, stiffening stage, and thawing stage—and can last for up to 18 months or longer before patients recover completely. Physical therapy is one approach that is commonly recommended to treat frozen shoulder, and it typically includes pain-relieving methods, hands-on techniques performed by the therapist and various exercises. Strengthening exercises for the rotator cuff—a group of tendons and muscles in the shoulder that allow it to move and keep it stable—are often included in these physical therapy programs; however, no studies have specifically investigated just how effective these exercises are for frozen shoulder. For this reason, a powerful study called a randomized-controlled trial (RCT) was conducted to determine if adding strengthening exercises to a standard physical therapy program would lead to greater benefits in patients with frozen shoulder. Individuals who had pain and stiffness in their shoulder for 1-3 months were recruited and screened to see if they were eligible to participate. This process led to a total of 42 patients being accepted for the RCT, who were then randomly assigned to either the experimental group or the control group. Both groups participated in a four-week physical therapy program, which took place over three sessions a week for 12 sessions total. The goal of treatment was to reduce pain, improve function and increase flexibility, and sessions consisted of scapular mobilizations and a transcutaneous electrical nerve stimulation (TENS) device. 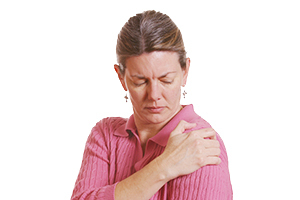 Mobilization is a technique in which the therapist moves the shoulder joint in a particular way with their hands, and TENS uses an electrical current to reduce pain. Patients in the experimental group additionally performed a variety of strengthening exercises for the rotator cuff muscles, which included elastic bands and dumbbells, and increased in intensity as treatment progressed. All participants were evaluated for pain, shoulder flexibility and function before and after these interventions. The findings of this RCT showed that although all participants improved, those in the experimental group experienced more significant improvements overall. This was found to be the case in all the outcomes measured, as experimental group patients reported greater decreases in pain and greater increases in flexibility and physical function compared to the control group. These results suggest that physical therapy, in general, is effective for addressing frozen shoulder, but the addition of rotator cuff strengthening exercises can lead to even better outcomes for patients. Individuals dealing with frozen shoulder should, therefore, be inclined to seek out the services of a physical therapist that prescribes these specific exercises to achieve notable improvements and accelerate the recovery process for this bothersome condition.